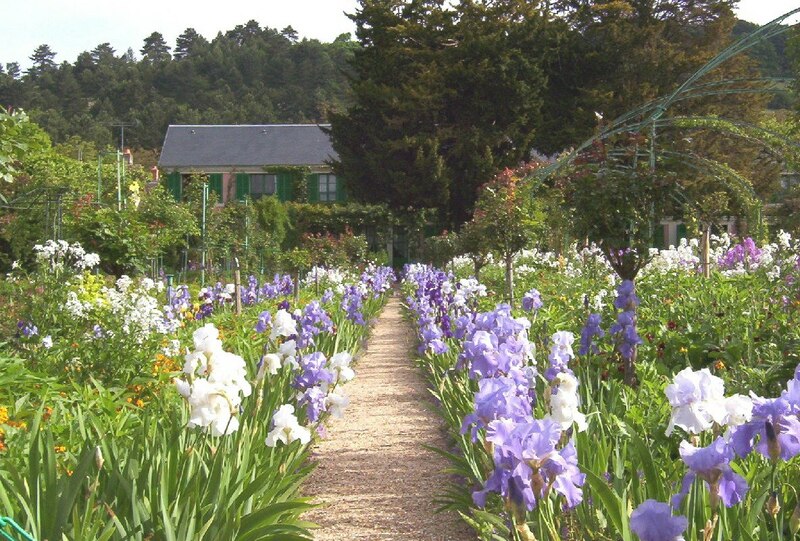 In the small French village of Giverny, we found Monet’s Garden that he began to build and cultivate back in the 1880’s. 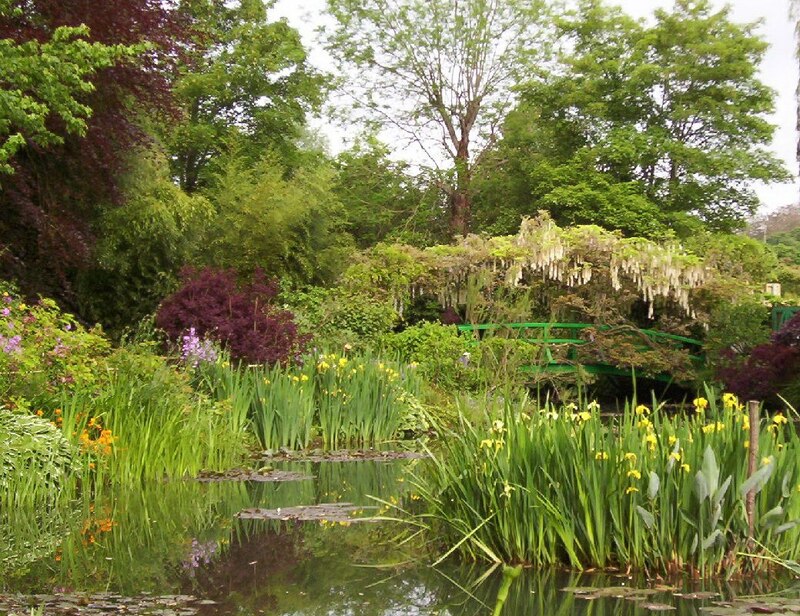 In 1890, the digging of his Nympheas basin was started for what would become his Water Garden. That garden, which is prominent in the work of art above, features both a Japanese Bridge and assorted plantings of Lily pads. Both of these elements became central components in many of Monet’s future works of art. 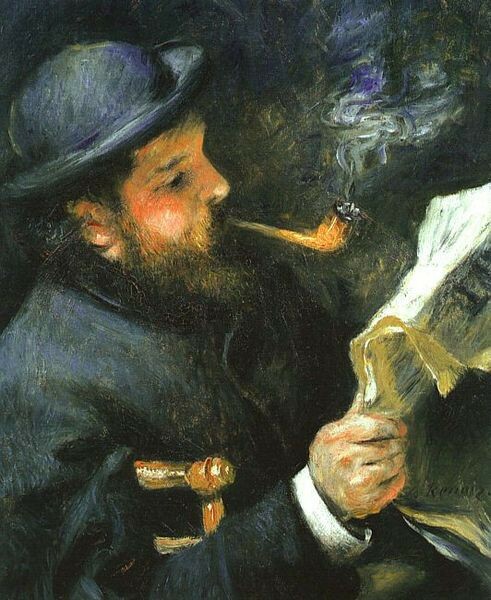 In 1872, Pierre-Auguste Renoir painted this picture of Claude Monet reading a paper and smoking a pipe. Two years later, in 1874, Claude Monet is credited with bringing about the birth of the art form called Impressionism when he exhibited his first collection of Impressionist paintings. Renoir is also considered a major player in helping Monet bring about the development of the Impressionist style of art. Bob and I often choose to travel in an off-the-cuff manner. 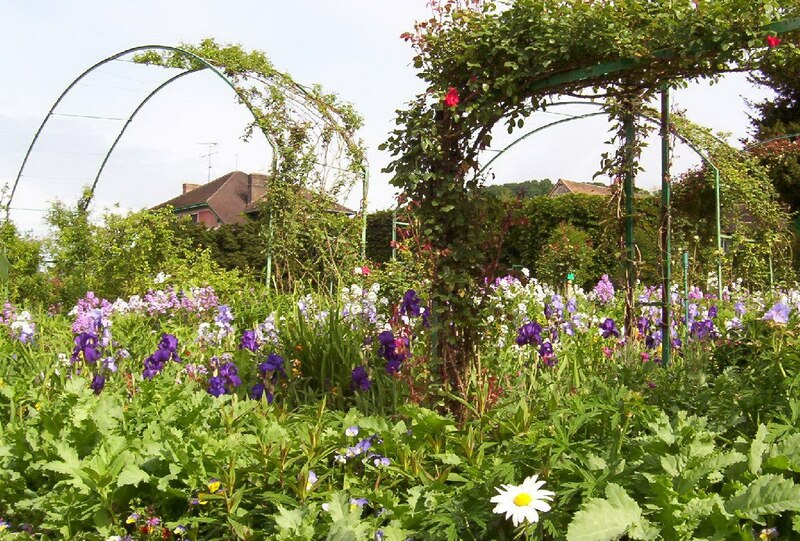 We had no prearranged accommodations in Giverny, but knew beforehand that staying there would afford us an early morning entry into the famous gardens. Also, staying in the village would give us a chance to see the different aspects of sunlight, which were a major factor in many of Monet’s paintings. 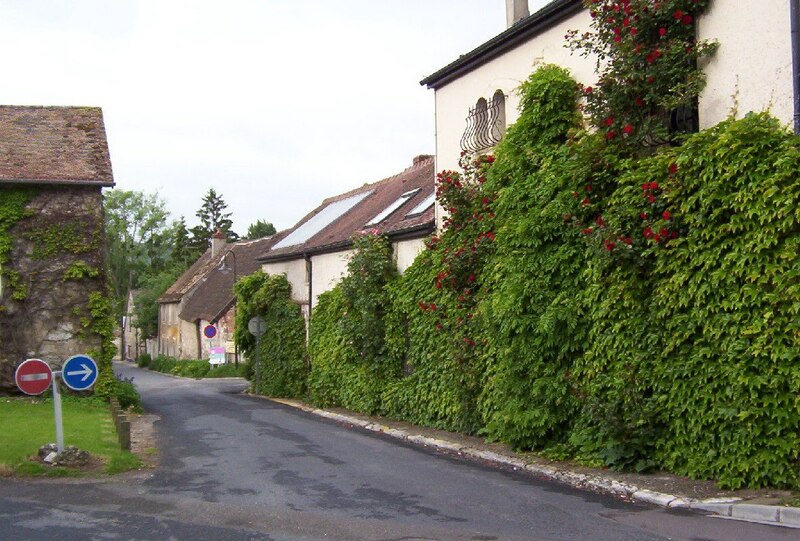 There are few places to stay in Giverny, but we managed to book a room in a quaint little inn called Restaurant Creperie La Musardiere. 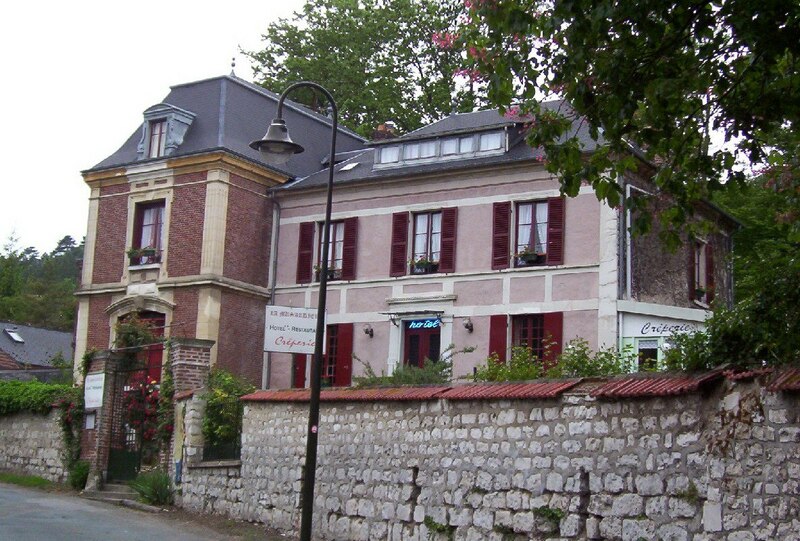 As it turned out, the establishment was home to both a Creperie and a small hotel, and it is just around the corner from Monet’s House and Gardens. 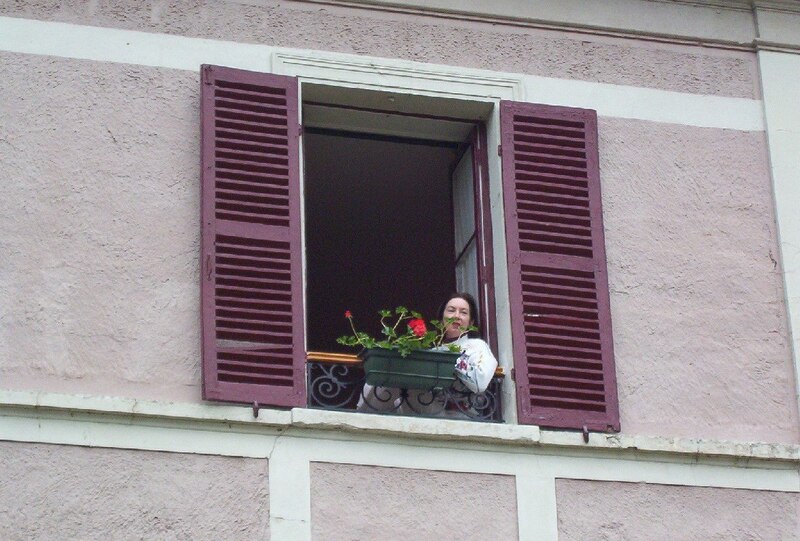 With warm and fragrant spring air gushing into our hotel room, I gazed onto the village below. 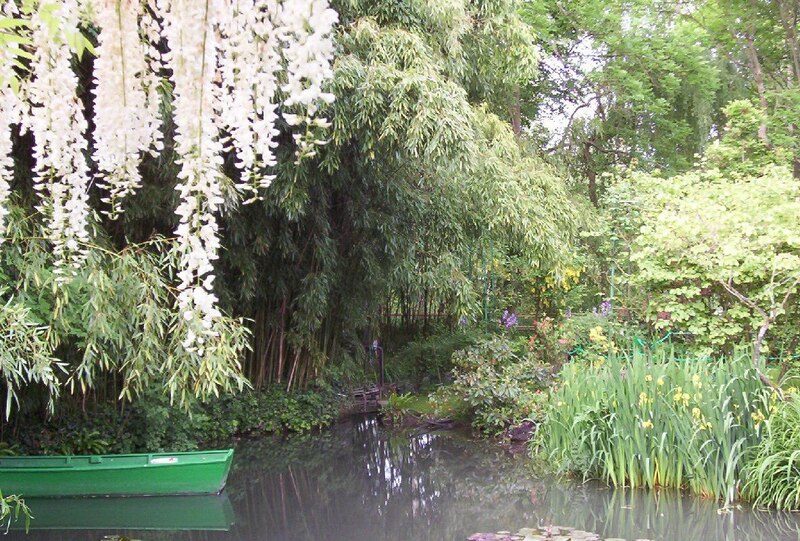 It was hard to believe that Monet’s Garden was just 100 meters down the road. The enchanting rustic dwellings and quiet country lanes seduced us into a sense of calm. 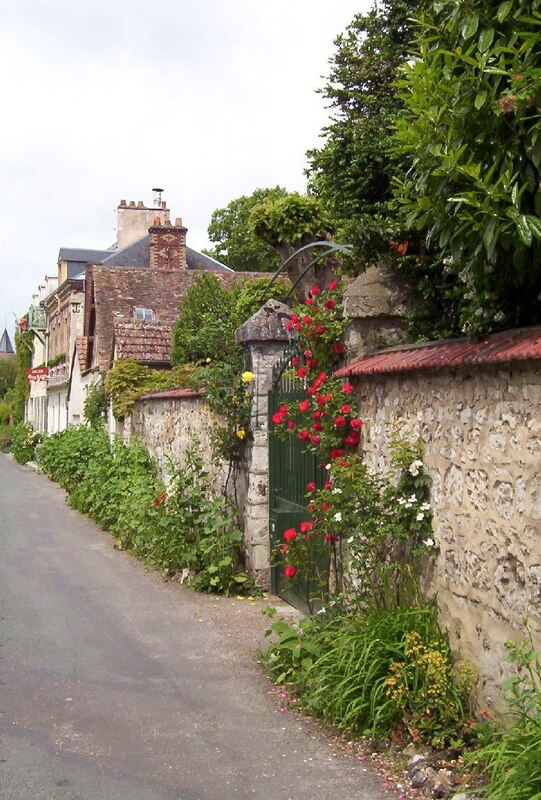 The next morning, prior to Monet’s gardens being opened to the public, Bob and I took time to amble along the streets and alleyways of Giverny only to discover climbing roses clambering over every stone wall, along aging wrought iron fences and up the sides of charming stone cottages. 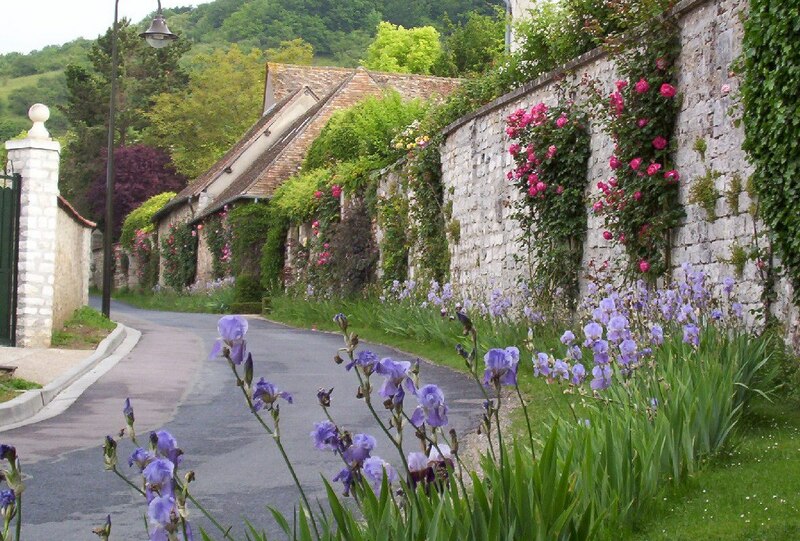 Purple irises were abundantly in bloom, gracing the edge of most narrow streets in the village. 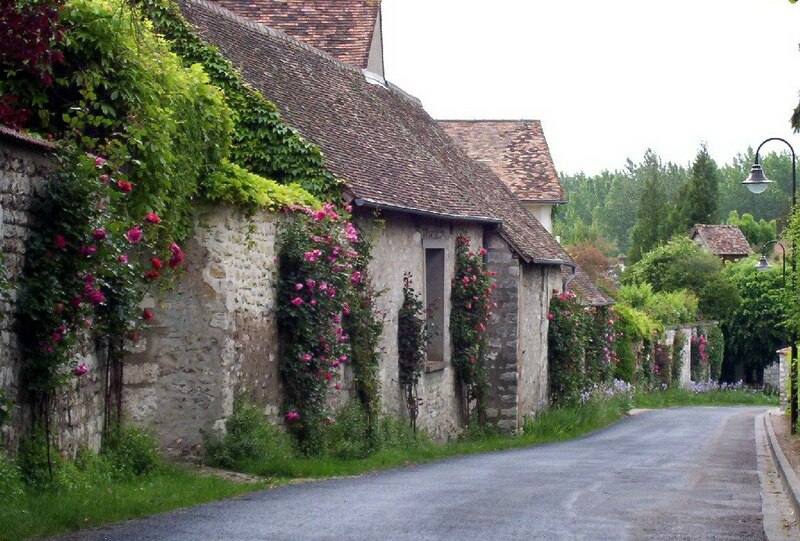 As we walked about, we soon began to realize that Giverny has done a great job of keeping up with the times, but also has managed to protect and retain the natural features that attracted Monet to this village in the first place. Having completed our walkabout the village, we arrived at Monet’s former home just as the garden gates opened for business. It was in this pink colored building that Monet and his family lived for many, many years. In this aerial view of Monet’s property, you see that his land was, and still is, divided by a roadway. 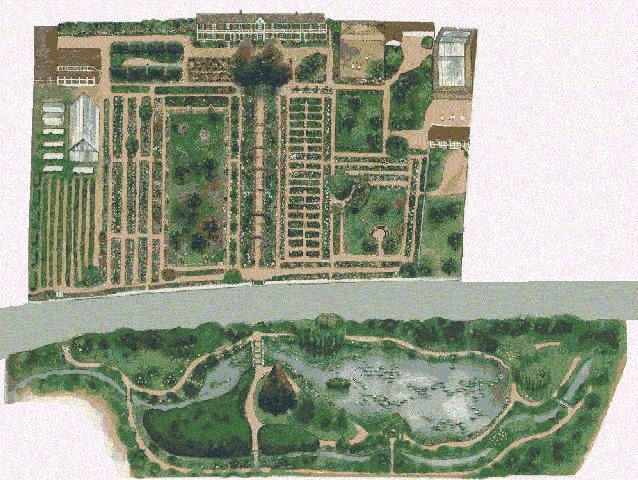 Above the grey roadway, in the top section of the drawing, is his former home and its surrounding gardens. And then below the roadway is his water garden where you find such features as his Japanese bridge and the pond filled with water lilies. 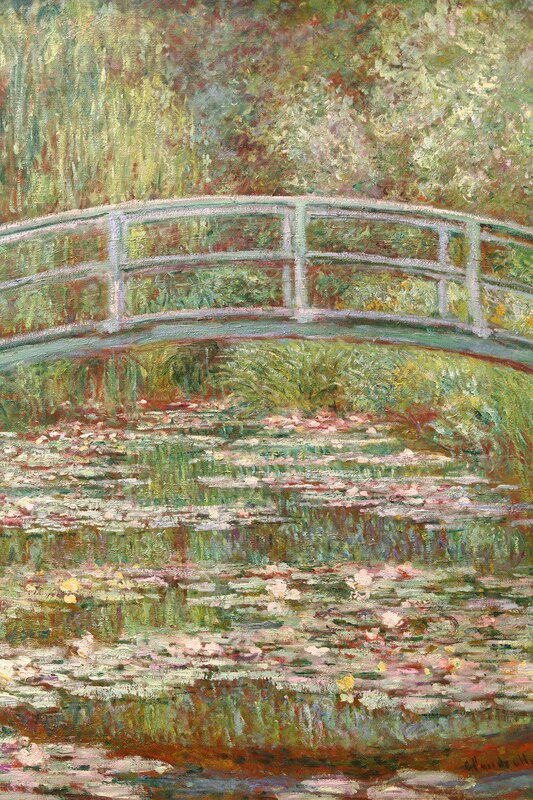 Monet painted several views of this Japanese bridge framed by a vast array of flowering plants and greenery. 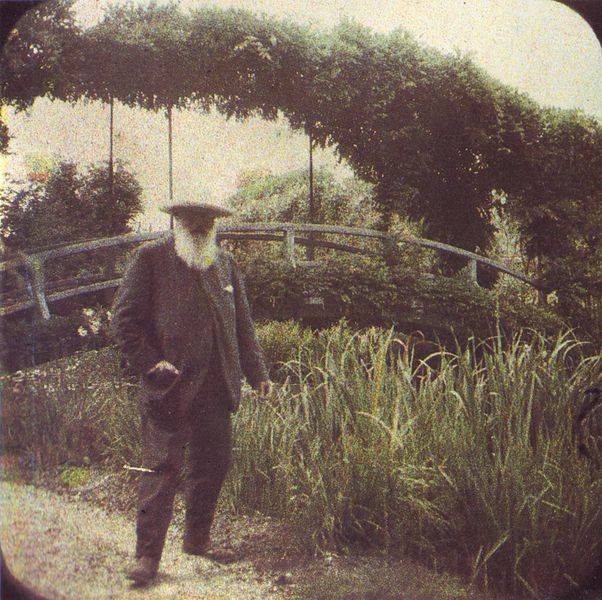 In this picture, we see Claude Monet standing in front of his Japanese bridge. 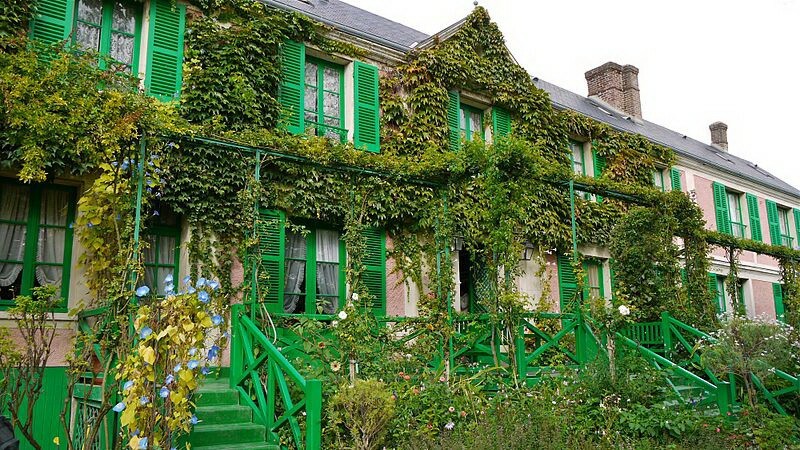 During the 43 years he lived in Giverny, Monet painted many familiar village scenes, and his gardens provided inspiration and subject matter for large numbers of his paintings. 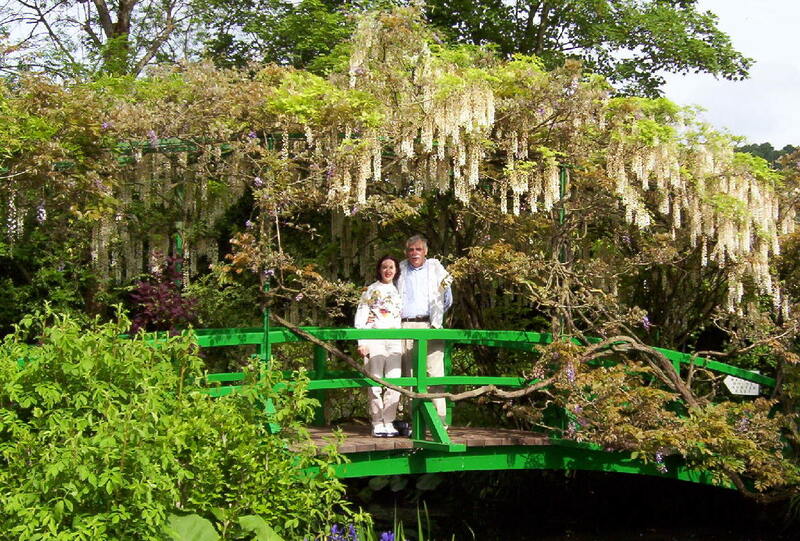 With the white wisteria draping voluptuously above our heads, Bob and I took time to soak up the exotic garden setting. The wisteria has certainly thrived and filled in the arch upon which it was started so many years ago. As we weaved in and around the walkways circling the water garden, we happened upon a primitive green rowboat tucked along the shore of the pond. This boat was used by Monet to undertake many of his water lily paintings, and his gardener used it every morning to clean off the water lilies that had collected soot from passing trains. 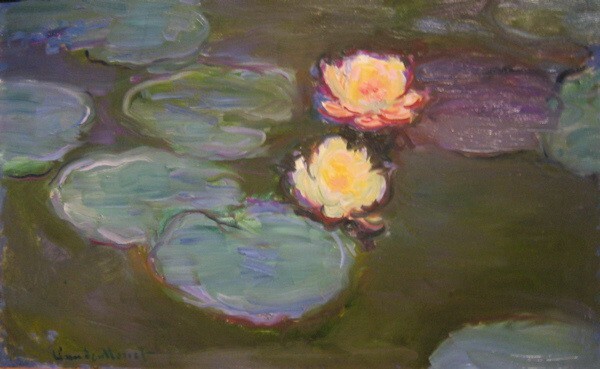 Keeping the water lilies clean played an important part in Monet’s paintings. He painted many different versions of them, and they went on to become some of his most sought after works of art. 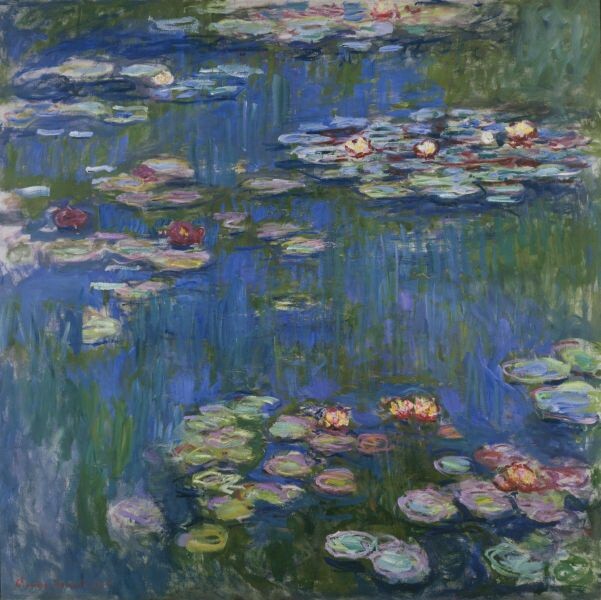 The painting of water lilies below, titled “Nympheas”, was auctioned off in 2o10 for an estimated selling price of somewhere between 30 and 40 million pounds. One of the key characteristics of impressionism was the use of small brush strokes, which was aimed at reproducing reflected light. Most often, this type of artwork was done outdoors. 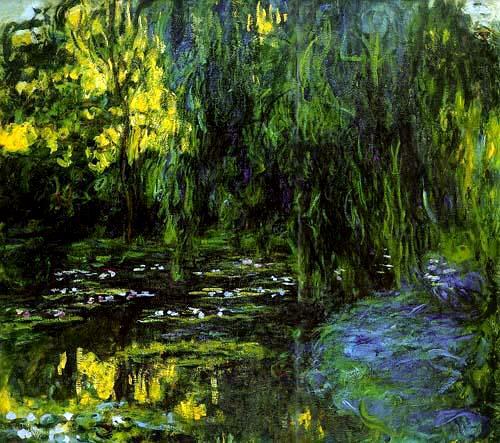 Monet spent much of his time trying to capture that reflection of light around the water lilies that grew in his water garden. This painting titled “Nypmheas” was one of his first ever efforts to capture that essence on canvas. Today, Nypmheas is on public display at the Los Angeles County Museum, in California, in the United States of America. Another of Monet’s paintings, in which he captured the reflection of light amongst water lilies, is this work of art titled “Water Lilies”. This painting is on exhibit at the Museum of Fine Arts in Boston, Massachusetts, in the United States of America. It was easy to see why Monet was so taken with the task of capturing the reflections of sunlight and colorful plants in the still water of the pond. Beautiful mirrored images abounded everywhere. 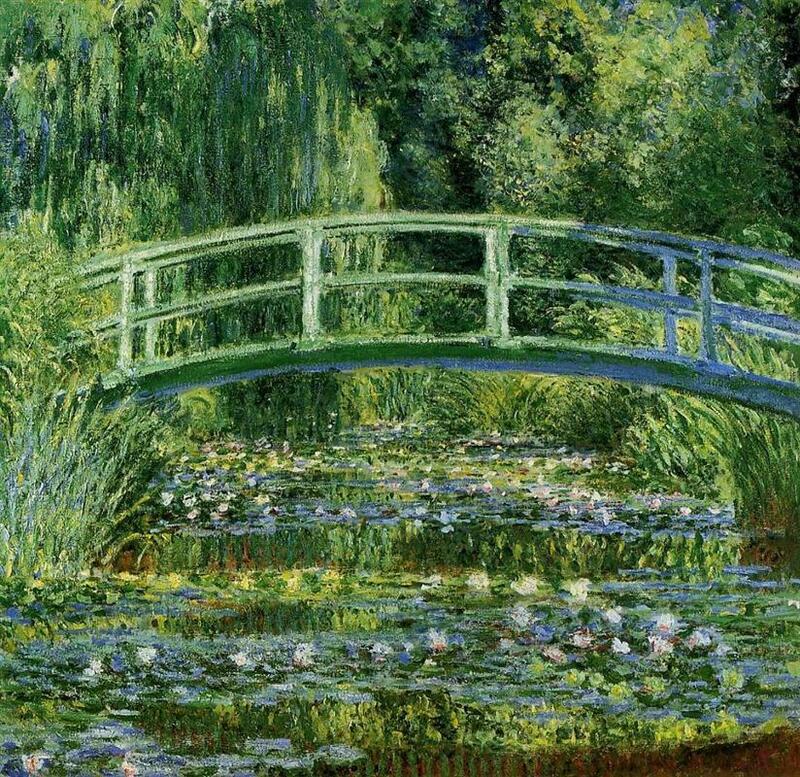 In 1899, Monet painted this oil on canvas titled, “Bridge Over a Pond of Water Lilies”. In later life, Monet was able to use the gardens he planted as a form of living still life that allowed him to use his memory and the emotions tied to the gardens, to then paint scenes like this one even as he was going blind. Between 1916 and 1919, Claude Monet painted this mural titled, “Water-Lily Pond and Weeping Willow”. As you see in my photographs above, the yellow wisteria featured in this canvas still grow and bloom exactly where he planted and painted them close to one hundred years ago. 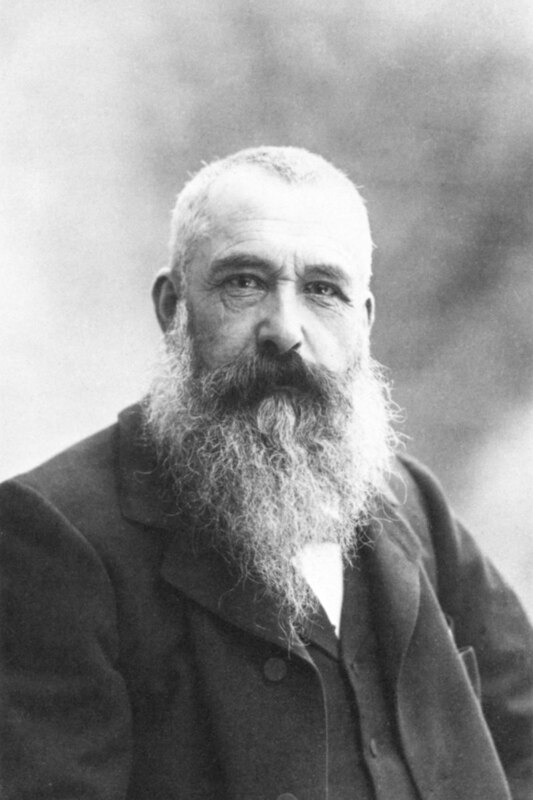 Monet was both a painter and a gardener. As we meandered about his gardens, it soon became evident that his living gardens are actually no different than his painted gardens. For Monet, the garden was a living still life that freed him to plumb the depths of his memory and emotions, rather than simply record his “impression” of a scene. 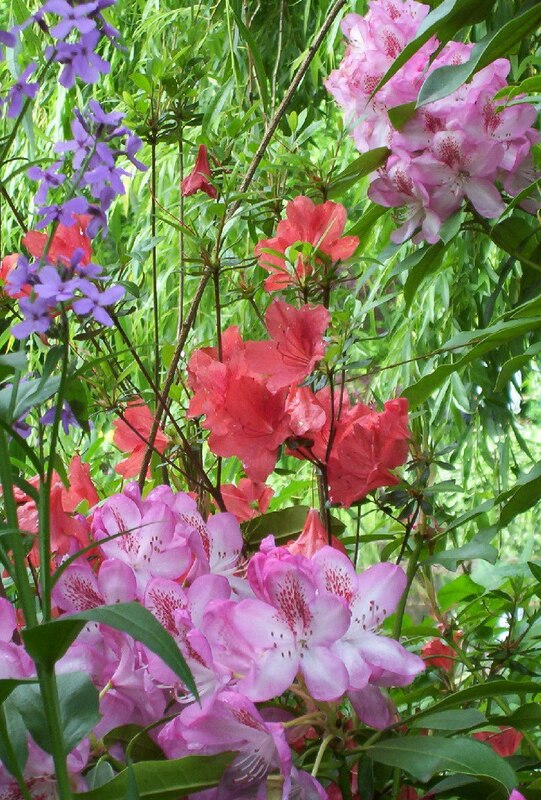 As I strolled the endless pathways of his gardens, I was taken by the mix of colors and flower selection. 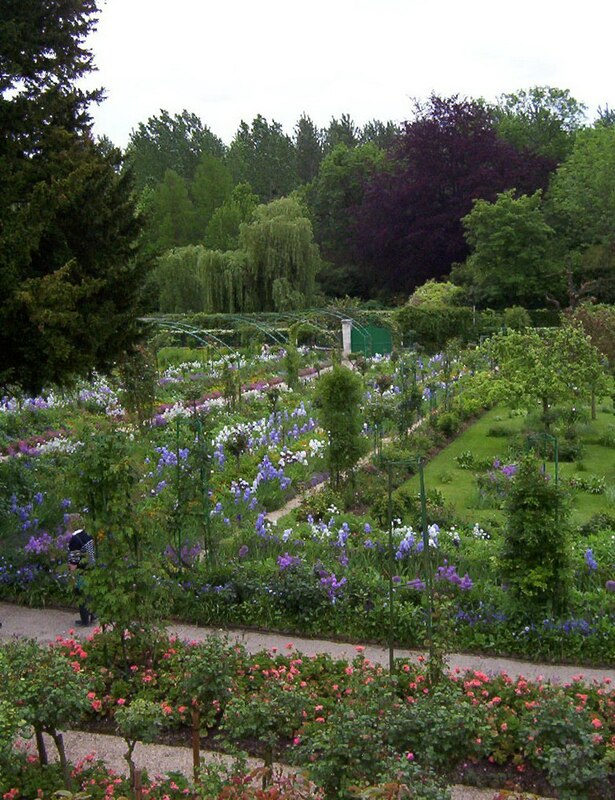 In fact, I learned while I was there that Monet controlled every aspect of how his gardens were laid out and what types of plants and colors would be planted in each flower bed. 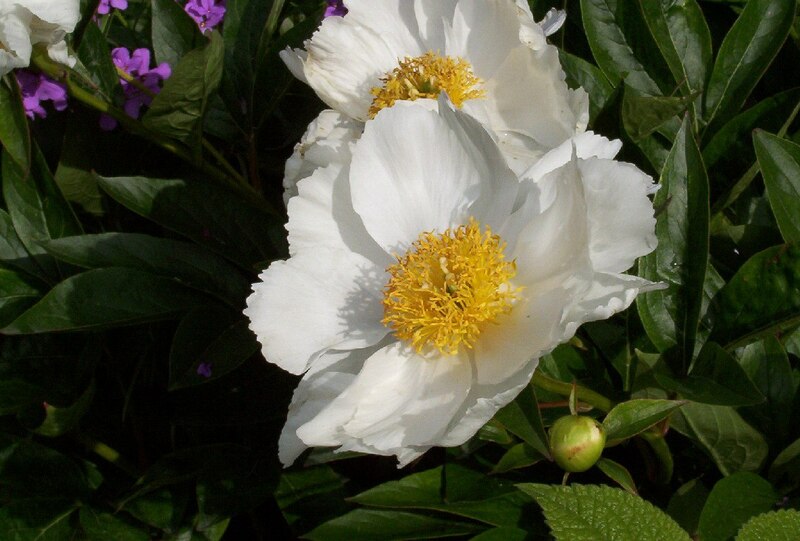 In many ways, the decisions he made are not much different than those we all face each spring…just what to plant and where to plant it. 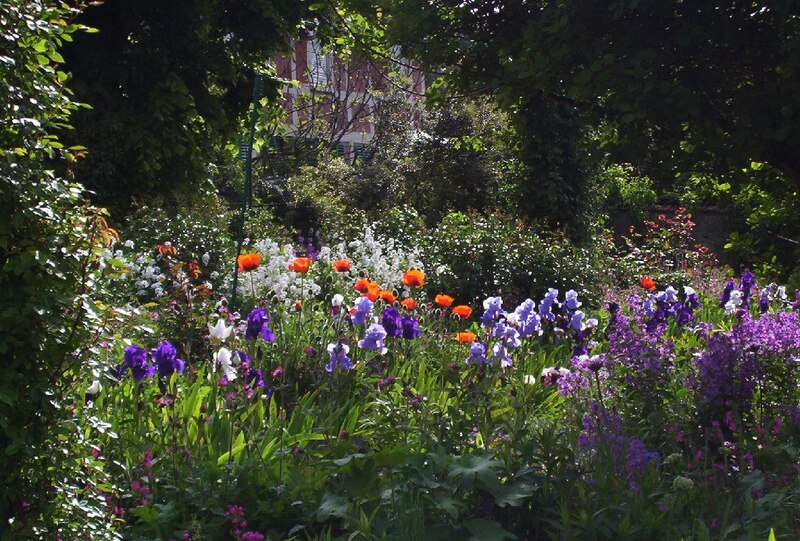 But in Monet’s case, those decisions went far beyond any of our typical gardening choices. His color selection and planting scheme proved to be the foundation of many of his major works of art. 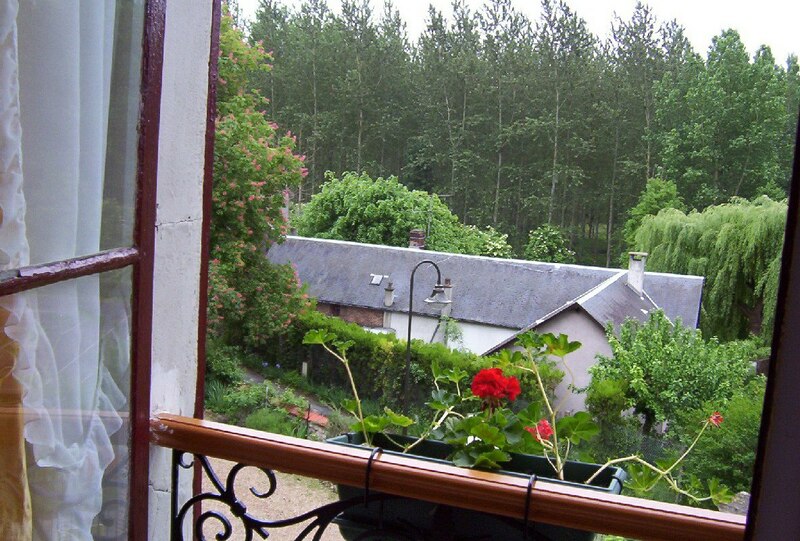 This is a view of the gardens from an upstairs window in Monet’s home. The early morning light really served to show the gardens to their best advantage. 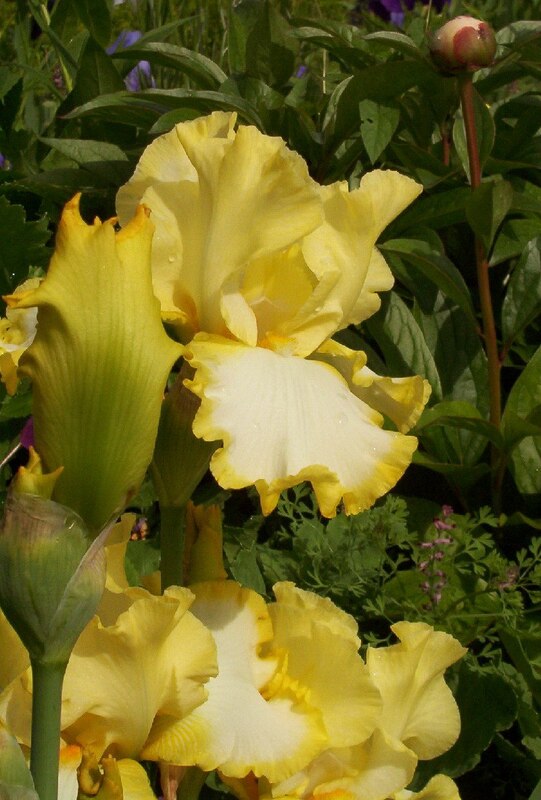 Near a shady glen, cup-shaped orange poppies floated atop a frothy swell of white phlox, while mauve and purple irises stood stalwart beneath a bower of green foliage. 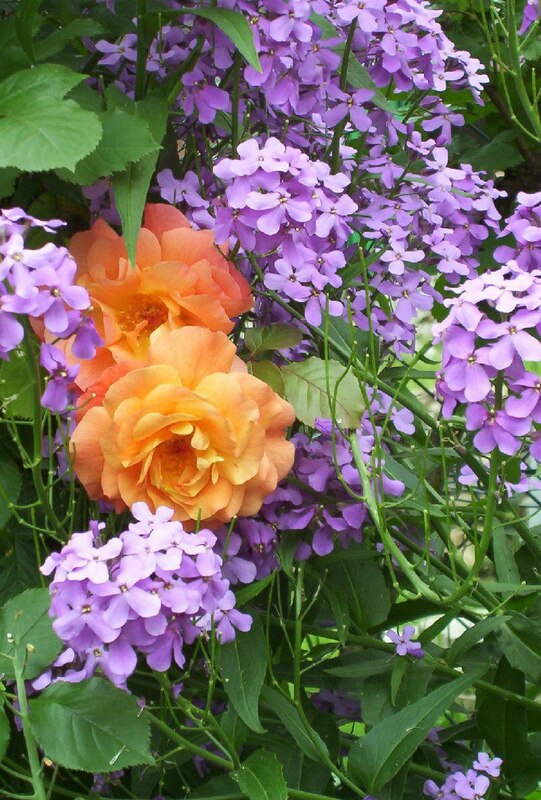 Sensuous peach-coloured roses peaking through a soft curtain of mauve phlox made a divine combination. I love roses…always have since I was about 3-years old when I was seen taking hefty breaths of the intoxicating perfume from my mom’s Hansa Shrub Rosebush. 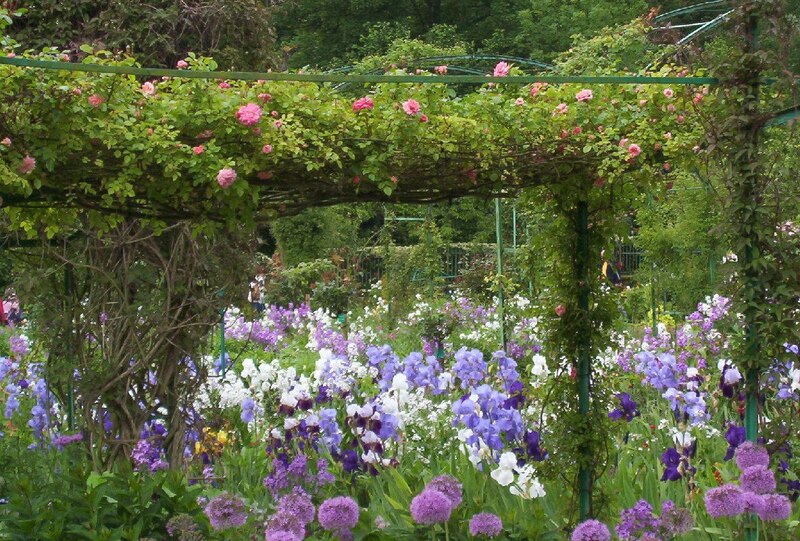 In Monet’s garden, I was enamored with the plethora of climbing roses. 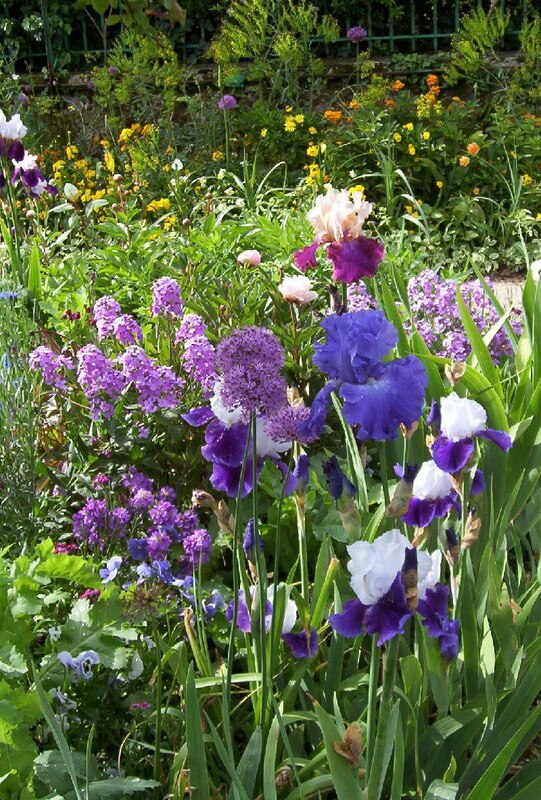 There, the mauve allium and purple irises bobbed amongst the billows of white blooms and flowed beneath rose-laden trellises into the distance. 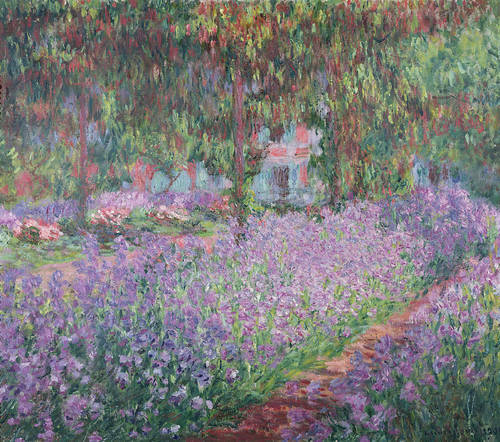 In 1900, this work of art titled, “Garden at Giverny”, was another of Monet’s creations. If you compare this painting to my photograph above, you can see that the trellises and plants are still pretty much the same as when he painted this mural. Today, this painting is on public display at the Musee d’Orsay in Paris. 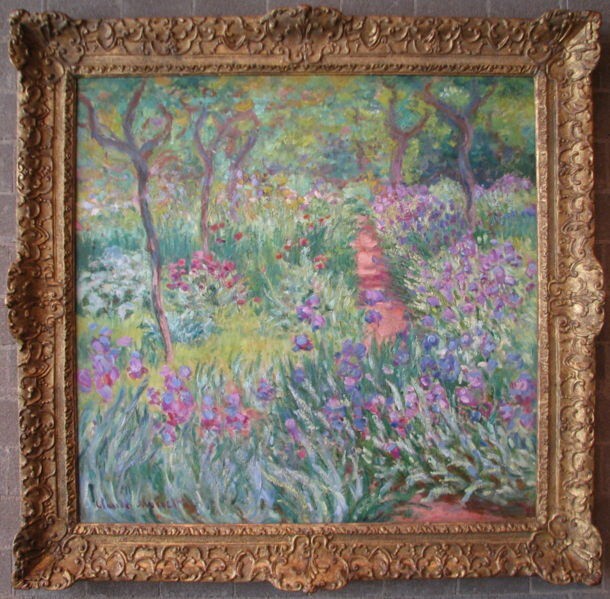 Another work of art that he painted in the gardens beside his home is this oil on canvas titled, “The Artist’s Garden at Giverny”. This canvas is now on exhibit at the Yale University Art Gallery in New Haven, Connecticut, in the United States of America. 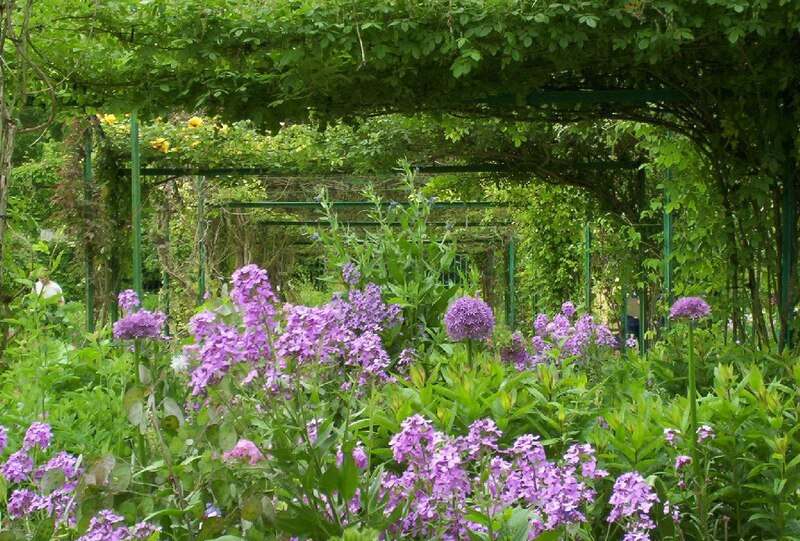 The extensive use of trellises, arbors and pergolas throughout the gardens at Giverny is what inspired my husband to build a beautiful arbor in our garden at home. I now have climbing roses that, each June, provide a rich mass of red blooms that spill through every opening in the latticework. The array of endless varieties of flowers in every colour of the rainbow at times made me swoon. I was in heaven amidst such beautiful plantings. 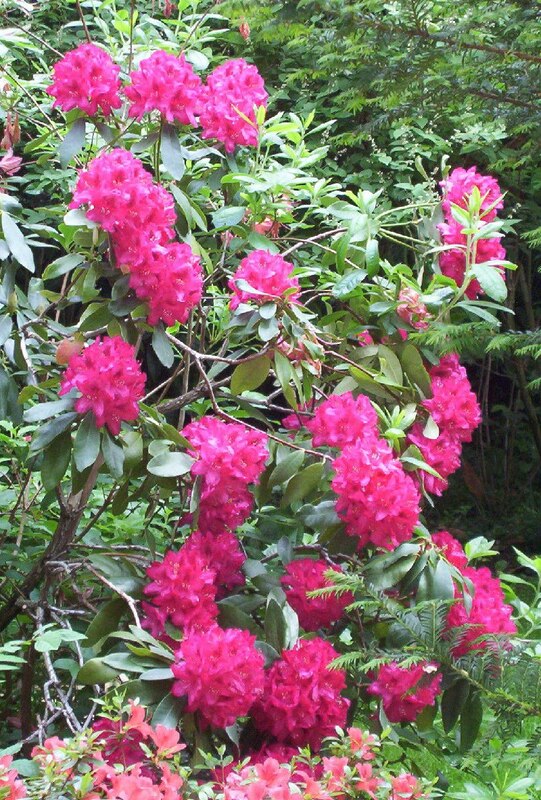 and vibrant Rhododendrons…they, all together, created a delight for the senses. Who could ask for anything more than Nature in its glory? 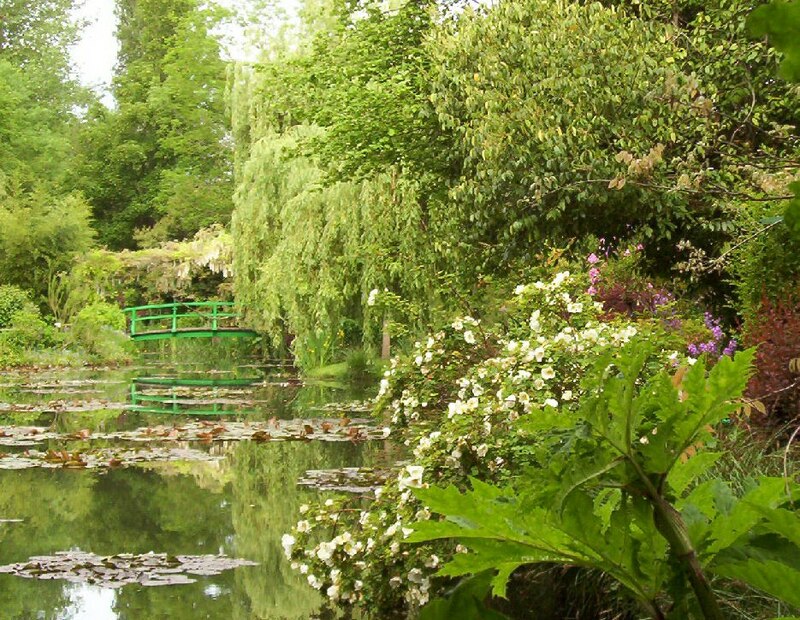 The Gardens of Giverny proved to be everything that we had anticipated and hoped for. We love when our photos are appreciated. Thanks for looking and sending along your comment. 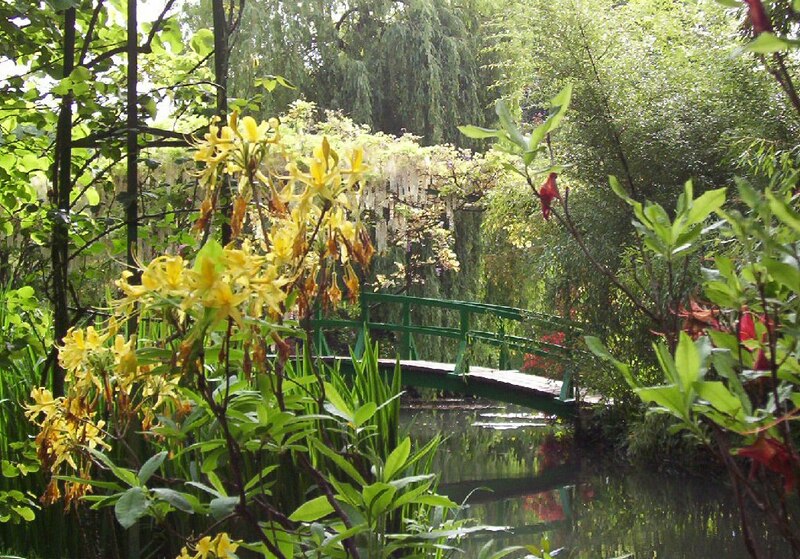 Ohh, these great photos bring back fond memories of visiting Monet’s Garden. Thank you! You are welcome! 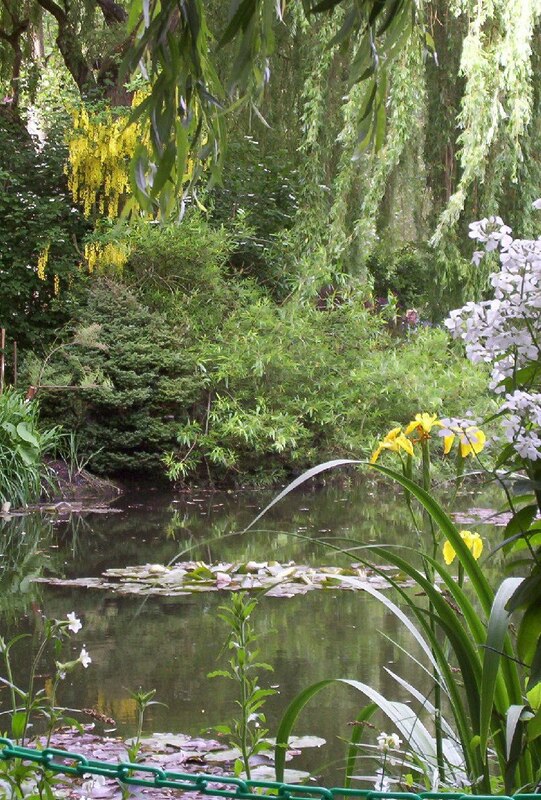 I loved the ethereal quality of the gardens at Giverny. The early morning sunshine cast such a mystical glow over the place. Thank you so much for posting this photo essay! I love Monet’s art and saw an exhibition of his work at the Boston Museum of Art about 15 years ago. 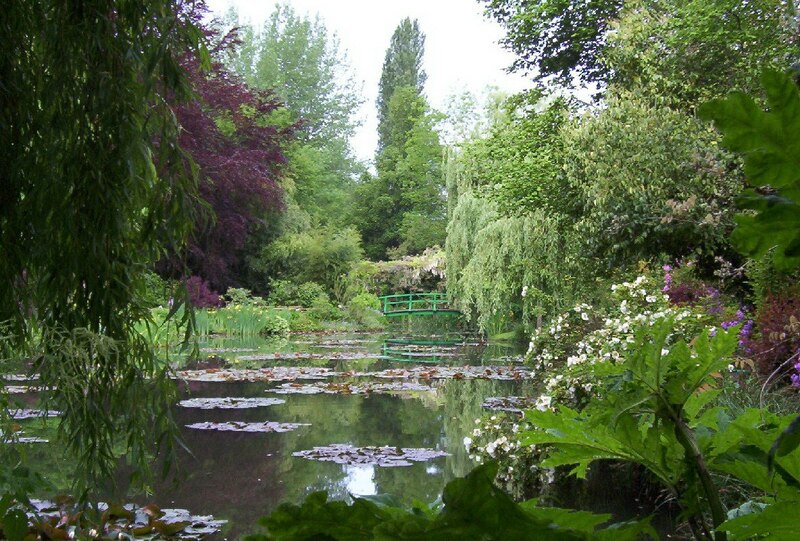 Now I know what Giverny and Monet’s Garden look like. I had wanted to go there last spring, but the people I was with were not interested in making the trip. What time of year did you visit, and how did you get there? Hi Eileen. The year we went to France, my husband surprised me with tickets to Paris as a Mother’s Day gift, so we traveled in late May. My husband drove us all over the countryside. We used Highway A13 out of Paris and got off near Bonnieres sur Seine. After crossing the Seine River, we followed Highway D201 and connected to Highway D5. Giverny is located right along Highway D5. It’s a magical place, isn’t it? Your photos capture it so beautifully and I especially appreciate your connections to the art and the history of the time. Your hotel sounds like a gem of a find! Lovely! thanks for your comments and appreciation of our blog posting. It always makes a place more interesting if you discover the history associated with it. Our hotel was charming, the use of my rusty French a little less so.